Marissa recently completed her BS degree in Wildlife and Conservation Biology at UNH. She grew up in the woods of Massachusetts listening to John Denver and camping in a pop up trailer. Now, when not spending quality time with trees and kids at White Pine, she can be found bouldering, creating/appreciating art, hiking and eating quesadillas. 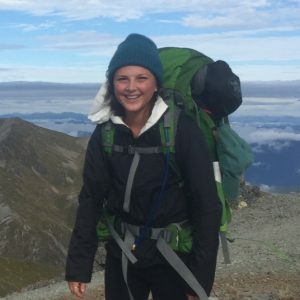 She has experience leading college students on back-country hiking trips and has spent time in the field researching small mammal ecology as well as the conservation of New Zealand endemic frogs. She’s thrilled to be immersed in the culture of nature connection as an intern and tracking apprentice at White Pine and is excited to be learning as much from her fellow Piney’s as they are from her.